Description: Fifth set of stairs on the Beachwood Canyon Loop (from Secret Stairs LA); fabulous views that make it worth the trip. 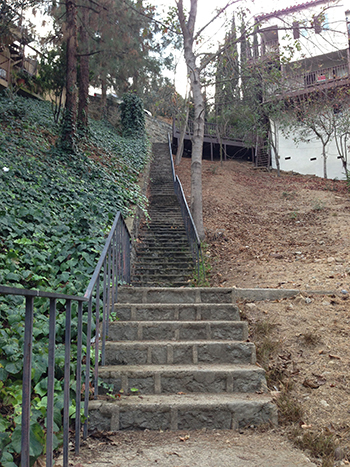 If you are doing the Beachwood Canyon Loop, then the big pay-off is this stairwalk, as from the top you'll be able to enjoy amazing views of iconic LA: Griffith Observatory, downtown Hollywood, Lake Hollywoodland Reservoir, and of course, the infamous Hollywood Sign (although I know how you can get an even BETTER view of the sign -- check out: www.HollywoodSignCloseUp.com). Making your way up these steps isn't all that bad, despite the fact that it's still uphill -- at least you can occupy yourself with the details that make this whole dang loop so enjoyable: more gorgeous granite cobblestone-ish steps, happy birds chirping, and knowing that all in all, it's great cardio workout. Makes you believe that you really are in a magical world, far, far away from the busy City of Angels. But you're not -- the last bit of the journey back to Beachwood is just down the road a bit. Make a right on Flagmoor, and then a left again back onto Belden, and the last stairwalk on the Beachwood Canyon Loop is just before 2872 Belden.